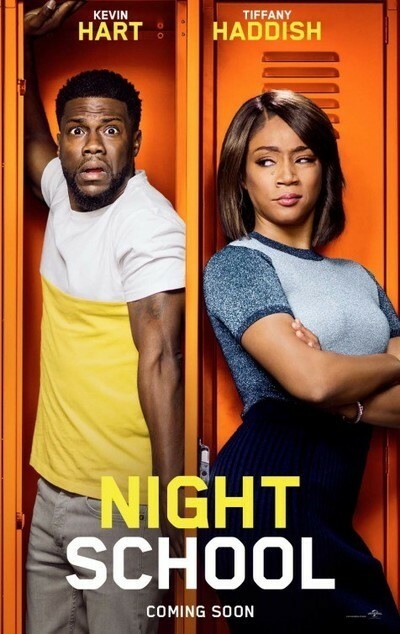 "Night School" is the barest wisp of a movie—a light, earnest, goofy comedy about a high school dropout (Kevin Hart) belatedly trying to earn a General Equivalency Diploma, in a night school classroom run by one of those super-tough but inspirational teachers (Tiffany Haddish) that movies can't get enough of. Nothing about it makes a lot of sense, but then, nothing about classic old comedies starring people like W.C. Fields or Laurel and Hardy made much sense, because they about oddballs getting into trouble and then trying to get out of it. "Night School" is a feature that has enough plot to fill a short film—except for the setup, which is needlessly elaborate. Hart's character Teddy Walker wants a GED so he can get a job as a salesman at a firm run by an old friend, in order to replace the job he lost at a barbecue grill store after he accidentally destroyed it; this is all in service of maintaining Teddy's spendthrift lifestyle, which is calculated to make his girlfriend Lisa (Megalyn Echikunwoke) think he's rolling in money even though he's perpetually one paycheck away from the poorhouse. There's a much simpler and more relatable story underneath all that: Teddy was a weak student who was called dumb all his life. If he can finally earn that diploma he gave up when he quit high school, he'll conquer the demons of his past. The classroom is a demographically diverse gang of lovable weirdos, all of whom have troubles of their own. Mackenzie (Rob Riggle) is a dropout who's been destroying his back working as a mover all his life, and wants a GED so he can get off the truck and move behind a desk. Teresa (Mary Lynn Rajskub) dropped out because she got pregnant by a domineering jerk that she's still married to. Luis (Al Madrigal) is a Latinx waiter Kevin contrived to have fired in a scene too complicated to go into here; he speaks mangled English and fantasizes of becoming the next Justin Bieber. Jaylen (Romany Malco) is a paranoid conspiracy theorist who's convinced that machines have taken over. Sometimes he stares into the distance and you just know he's imagining the opening of "The Terminator." A felon named Bobby (Fat Joe) is attending night school via Skype. He takes his lessons so seriously that when he's interrupted by an attempted shanking, he roars, "I'm trying to learn!" as he thrashes his attackers. And so on. They all have big (or small) dreams, like Teddy. But because night school is just too demanding, they start dreaming up shortcuts to graduation. And that's where the trouble starts. Hart holds the whole thing together—he has a classic deadpan face, and is even funnier reacting silently than when he's rolling around on the floor and shrieking his head off—and the comic spark between Teddy, Carrie, Stewart, and all of the other characters is undeniable. Every actor gets one or two little arias of verbal tomfoolery or wild slapstick. Best in show goes to the sequence where the gang tries to sneak into the school after hours; the crew lets Bobby participate via iPhone, and the climax is a pratfall that would've killed all three of the Stooges. But the most distinctive moments are built around wordplay—a character hearing the word Roomba and mentioning that his wife takes rhumba classes, for instance, or another character being informed that he has "a processing disorder" and screaming, "prostate cancer???" Admittedly there are probably only a handful of people who find this kind of material funny (reviewer sheepishly raises hand). But it's to the credit of Lee and his collaborators that "Night School" pitches a comedic tent big enough to contain something silly for everyone. Thinking back on the movie, I'm torn between wanting it to be more than it is, and being impressed that something so loosely assembled didn't instantly fall apart. It's overlong and shaggy, and alternately too thin and too dense, and it keeps veering into sentiment that it doesn't entirely earn. But in the end, you still feel for the characters, because the actors are so appealing, and because the movie understands that even though most films rarely utter the initials GED, in the world beyond the screen, it's a goal worth sacrificing for.